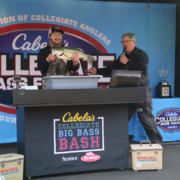 The final day of the 2018 Cabela’s Collegiate Big Bass Bash presented by Berkley is in the books. Paris, TN once again has been a warm and welcoming host for the past several days to the college anglers, however the weather didn’t get the same memo on this final day of tournament competition. 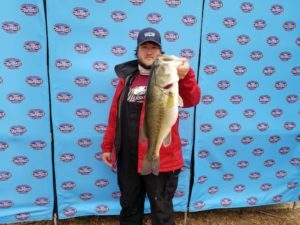 Today, cool temperatures and rain moved through the area posing a good challenge for the field of nearly 500 collegiate anglers out on Kentucky Lake. 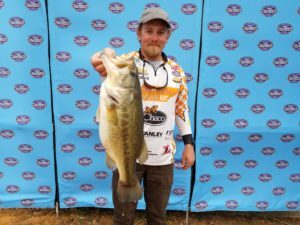 Kentucky Lake has been a formidable opponent for the field of competitors this week. Heavy rains flooded northwest Tennessee and the surrounding areas over a week and a half ago. The resulting rains in the area saw Kentucky Lake rise 10 feet above its normal level for this time of the year and then begin to fall. As the gear is being packed away and anglers start to make their trips back home tonight, the lake sits at 361.25 feet and falling. For early spring time fishing, rising and falling water levels provide a tough challenge to tournament anglers as the fish are on the move hourly. A majority of the collegiate anglers today mentioned the high water effecting their decision making. These Kentucky Lake bass have pulled out of the flooded cover and set up just outside of these areas and are ready to feed. One of the first anglers to come across the stage with one of those hungry bass early this morning was Conner Dimauro from Bryan. 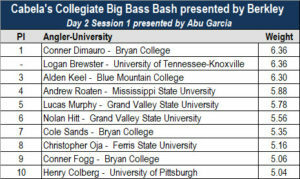 Conner brought a 6.36 lb largemouth across the stage to claim hold of 1st place in session 1 presented also by Abu Garcia. 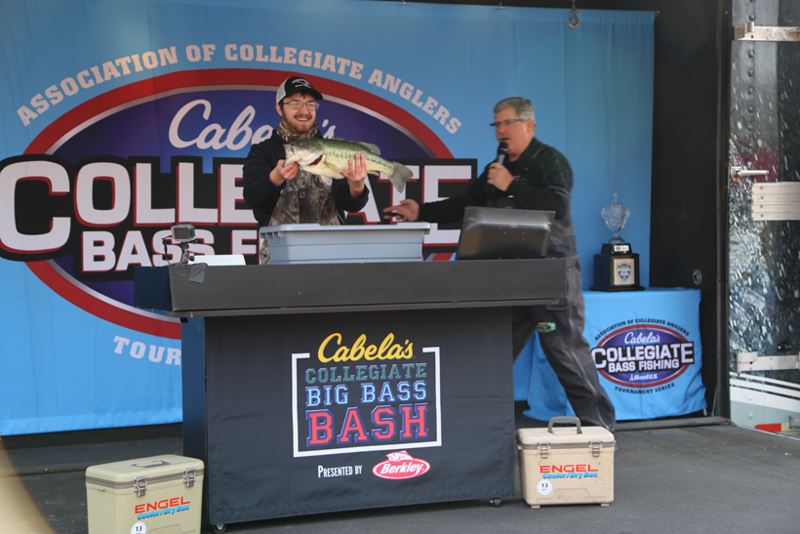 Logan Brewster from the 16th ranked Cabela’s School of the Year, University of Tennessee-Knoxville, was not to be out done, as he too weighed in a 6.36 lb largemouth bass. This created a tie at the top of the session 1 leaderboard. This winning weight is of significance as it is the smallest fish to win a session during this event. With the exception of two sessions, this fish would not have placed any better than 3rd. Strategy and decision making is key in a big bass format event. From year to year, the first session of each day tends to see the lowest weight totals earn prizes. Some anglers run off too far down the lake to make it back within the first two hours. Others struggle to find a groove to catch fish, and need several hours to settle in and do their thing. The Bryan College team, who won the 2017 Cabela’s School of Year presented by Abu Garcia title, had no problems settling in and getting to work early during session one on the final day. On a day where clocks were moved forward, and anglers had trouble keeping their eyes propped open, Bryan College raised some eyebrows in the first session. Three members of the team placed in the top 10. The smallest fish to earn a prize weighed in at 5.04 lbs during the session. Session two got off to a hot start as anglers were waiting to get their fish across the scales as the clock struck 9:01 am. 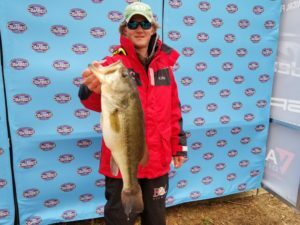 Andrew Chapman from Wallace Community College-Dothan/Eufaula was one of those anglers. He came up to the scales with a fish weighing 7.17 lbs. During this session presented by Gill, the threat for rain began to enter the area. Anglers came to the stage wearing rain gear, and boots in preparation for what was to come. Typically, the threat of a front moving in with rain can trigger fish to begin to bite. Unfortunately that was not reflected in the fish brought to the scales during session 2. In the two hour weigh-in window for this session, only 26 fish crossed the scales. A 4.96 lb bass took 10th place. This was the only session through the entire tournament in which a fish weighing less than five pounds earned a prize. Kentucky Lake was on fire this weekend. The number of five pound fish to come to weigh-in was astonishing. Also astonishing were the various ways anglers caught fish. The bass were hungry and willing to bite anything that crossed their face. Anglers reported catching fish on everything from football head jigs, to crankbaits, and even Alabama rigs. Session 3 saw a change in pace from session 2. This session, presented by Cabela’s, had a flurry of anglers rush to the scales as the 1:00 pm cutoff neared. The most closely contested session of the day, the 1st place and 10th place anglers in session 3 were separated by less than 1.25 lbs. 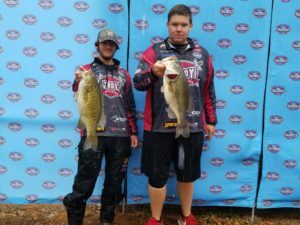 Zach Lineberry(Right) from Troy University, ranked 89th in the Cabela’s School of the Year standings, weighed in a 6.72 lb largemouth to surge to the top. This was the first fish brought to the scales by the Troy University angler during this event. Lineberry’s fellow teammate, and co-angler, Justin Jones(Left), also placed in the top 10 during session 3. Jones brought in a fish tipping the scales at 5.68 lbs, edging out 10th by .04 lbs. If one angler from a given boat pairing weighed in a fish, it seemed as though the other competitors in the boat also had fish to weigh in. The fish on Kentucky Lake this weekend were stacked tightly together. Catching one keeper fish typically meant there was a good concentration of fish in the area. Numerous times this weekend, the same pairing of teams would come in during multiple sessions with each member in the boat bringing in quality fish. The fourth and final session of the day saw its share of quality fish as well. Boris Moskoff of the 11th place ranked Cabela’s School of the Year, Murray State University, came through just after 1:00 pm to take the early lead. Not to be out done, Chet Reaves(pictured) surged past Moskoff with a 7+ pound fish. 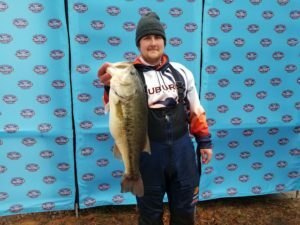 The Auburn University angler, who is ranked 8th, set a new mark to beat of 7.62 lbs. 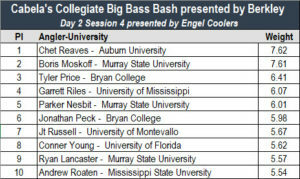 Many anglers came to the stage during session 4 presented by Engel Coolers, looking to challenge Reaves. None of the other anglers came within a pound of the top spot. 5.54 lbs rounded out the top 10 in the final session, continuing the trend of a 5 lb fish being the minimum weight needed to claim a prize. This week at Kentucky Lake has been amazing, to say the least. The fishery is in great shape. High water levels, and changing weather conditions couldn’t overshadow this great body of water. 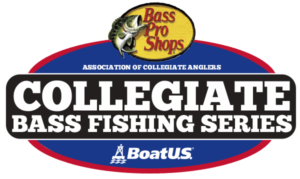 Nowhere is this more evident than in the overall standings for the 2018 Cabela’s Collegiate Big Bass Bash – presented by Berkley. 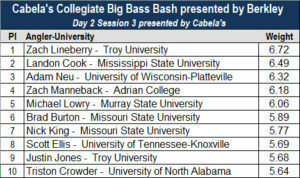 To view the final standings for the overall big bass click here. To view the current ranking of the Cabela’s School of Year Race presented by Abu Garcia, click here. Continue to view more content from this weekend’s event by visiting our various social media channels. Further insight into how the winner’s caught their fish, and more details about the results of this event will be posted in the coming days.